Who doesn't love cookie monster?! He's crazy and lovable all at the same time just like each of my children. A classic in most any home now a days, Warner Bros. Home Entertainment released Sesame Street: The Cookie Thief on March 1st, 2016. After reading this DVD features "self-regulation concepts – such as impulse control, following directions, and managing emotions", I knew it would be a good one for Declan (my little monster). 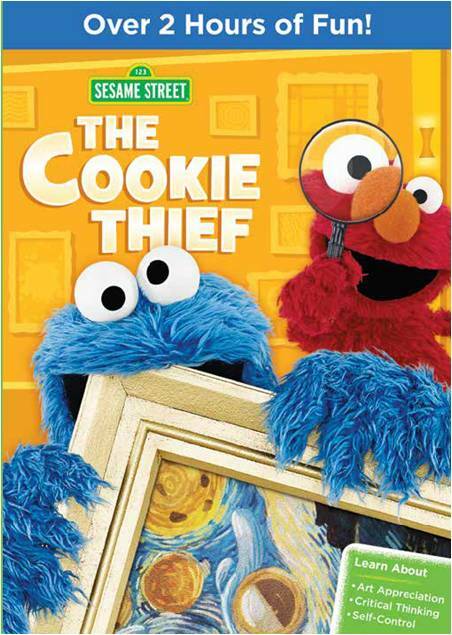 The synopsis says "In Sesame Street: The Cookie Thief, a cookie art museum has just opened on Sesame Street. Surrounded by beautiful cookie paintings, like “Girl with the Cookie Earring,” and the “Muncha Lisa,” The museum is full of excitement with learning opportunities around each corner. Cookie Monster and his friends feel like they’re in a whole new world. But when art suddenly starts to disappear, Cookie Monster quickly becomes a suspect. Can Cookie Monster clear his name? Will they find the missing art in time, or will Cookie Monster be banished from the museum forever?" Declan was actually pretty excited about this one which made me quite happy. Sometimes Declan can tend to go overboard...with everything. We try to teach him to take a step back but coming from us it's a bit harder. Watching him watch the DVD, I knew he'd enjoy something more subtle with his favorite characters onscreen. Giveaway: Warner Bros. Home Entertainment is going to give one of A Lucky Ladybug's lucky readers Sesame Street: The Cookie Thief on DVD to have of their own! Being nice to their siblings. Trying to eat their food properly. It's a struggle to realize that not everything in the world is theirs! My granddaughter actually struggles to not watch Elmo videos on my phone 24/7. My little one struggles with sharing. She is currently struggling to walk. our son has trouble making friends. he is shy and awkward with new people. listening to what we tell him to do he want his way all the time.